Spread the batter into a greased 9-inch springform pan (or a high-sided 9" round cake pan, if you don't have a springform). Arrange quartered figs over top of the batter (I did them in concentric circles). Feel free to really crowd them in there. Once arranged, sprinkle figs evenly with 1 Tablespoon of granulated sugar. Bake for 55-60 minutes, until risen, browned, and a tester inserted in the center of the cake comes out clean or with a few moist crumbs. Cool for 10 minutes before running a knife around the edges of the cake and removing the sides of the springform pan. 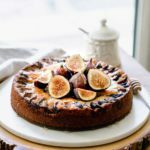 Let cool completely before garnishing cake with additional fresh figs and honey, and serving at room temperature with yogurt and hot coffee! Recipe adapted from my plum coffee cake. Cake will keep, well-wrapped at room temperature, for up to a day. It will keep up to 5 days in the fridge. I think it's best served at room temperature!